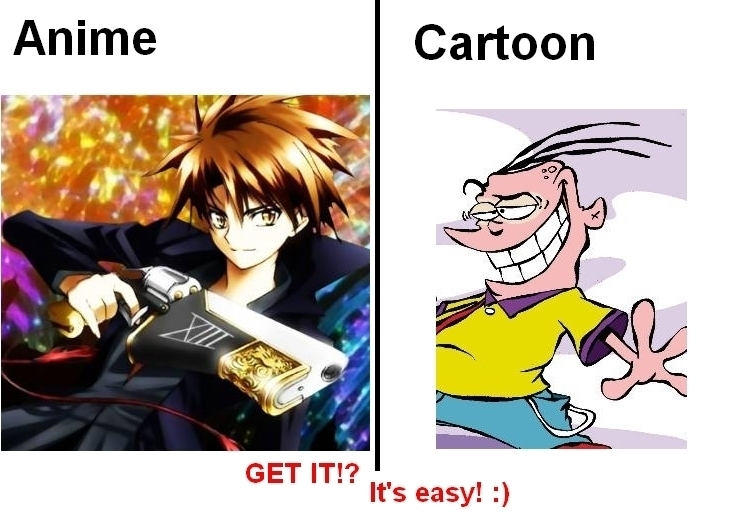 What's anime and What's Cartoon!. I HATE IT WHEN PEOPLE THINK anime IS CARTOON! WHy agrees with me!?. HD Wallpaper and background images in the hoạt hình club tagged: cartoons animation tv screen shot anime what's what stupidity. I know, it kinda annoys me sometimes. i understand u PoddoChan i hate it as well!! Actually, Anime IS a cartoon. When you get down to the basics, they're both the same thing. The only difference is that anime is from Japan. When you peel and strip away any and all regional differences, you'll find that, in terms of media, anime like Corpse Princess and Gun X Sword are no different than cartoon shows like Sonic the Hedgehog: The Animated Series and Teenage Mutant Ninja Turtles. Also, I might add that some american cartoons like Transformers and Spider Riders actually use the japanese animation art style. anime is cartoon. what? so bugs bunny is anime?!?! Anime is a cartoon from Japan. Is that so hard to understand?